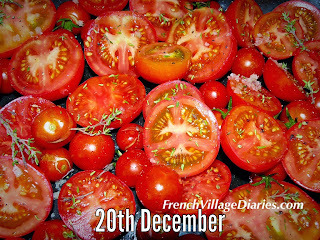 Welcome to my French Food Alphabet Advent Calendar where I am working my way through a selection of delicious food posts; some are regional specialities, some are my personal favourite foods, some posts include recipes, but all are linked to French food and drink. I hope you are enjoying your virtual tastings. 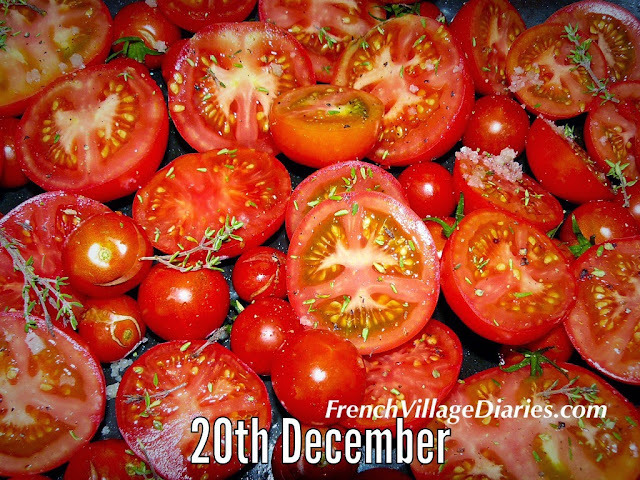 It’s the 20th December and T is for Tomatoes. Tomatoes are a very important part of our semi-self sufficient life in France; from the seed sowing in March, to looking after the tender seedlings in April, to planting out in May, to watering, weeding and side-shooting in June, to (hopefully) starting to harvest from July. That is when the fun in the kitchen begins. We try to grow at least three different varieties and usually have around fifty tomato plants each year. Some will be small and sweet cherry tomatoes, some are pretty and colourful varieties that are perfect for salads and some are grown for their size, quantity and flavour and are ideal for roasting, puréeing and freezing. This delicious red elixir is then used in pasta dishes, casseroles, soups and as pizza toppings throughout the year. It is obvious that I love tomatoes, but I have a secret, I only eat home grown tomatoes. Out of season I never buy them as I just don’t like the taste, in fact as a child I didn’t think I liked them at all. It was only when someone gave us some tomato seedlings about 15 years ago that I realised they could taste nice and were worth eating. Now I couldn't imagine a summer without them. Here are some links to my favourite tomato recipes: tomato ketchup, tomato chutney and tomato and chilli jam. T is also for Terrine de porc and Tourteau, a cheesecake speciality of our local area. Don’t forget to pop back tomorrow for the letters U and V (well there are 26 letters and only 24 days). If you have missed my previous advent posts you can catch up by clicking on the letters A, B, C, D, E, F, G, H, I, J, K, L, M, N, O, P, Q, R and S.